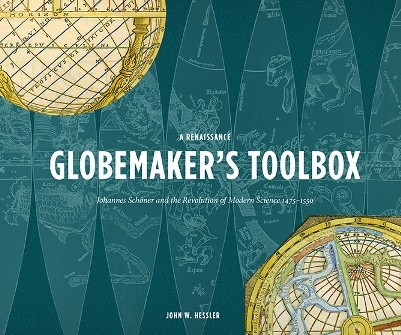 Johannes Schöner will never be a household name, but it’s nice to see him get some attention in John Hessler’s A Renaissance Globemaker’s Toolbox . More generally, however, by looking closely at what Schöner thought important enough to preserve in these collections of mathematical, geographical, astrological, and astronomical information, and how he might have utilized it in his work, we will gain deep insights into the epistemological revolutions that occurred at the end of the fifteenth century and the beginning of the sixteenth. The years between the amazing discoveries of Columbus and Copernicus saw the beginnings of the birth of modern scientific thought and in the chapters that follow we will see Schöner fully engaged in the intellectual transitions from the science of Aristotle and the geography of Ptolemy, to that of Copernicus and Ferdinand Magellan (1480–1521). The dates of the materials that Schöner compiled are mostly from 1475 to 1540 and represent a cross-section of central scientific materials from pre-Copernican science. Each of these books and manuscripts is interesting in its own right but taken together they provide a case study for the use and transmission of scientific information in the Renaissance through the eyes of a contemporary consumer of these materials. Schöner’s toolboxes are nothing short of encyclopedic and his use of them helps us understand in a unique way how our modern scientific worldview came into being. Nothing in the book points up more clearly Schöner’s pivotal place in a world in transition from the medieval to the modern than his residual interest in astrology and his awakening curiosity when he apparently heard reports of a new theory being formulated by a Polish Catholic cleric. Schöner’s interest in that “new theory being formulated by a Polish Catholic cleric” probably owed more to his interest in astrology and making astrological prognostications than the modernity we see in Copernicus’s theory. Along with his prognostications and calendars, Schöner also wrote books on astrology before and after Copernicus’s De revolutionibus was published, notably his Opusculum Astrologicum in 1539 and De iudiciis nativitatum Libri Tres in 1545. 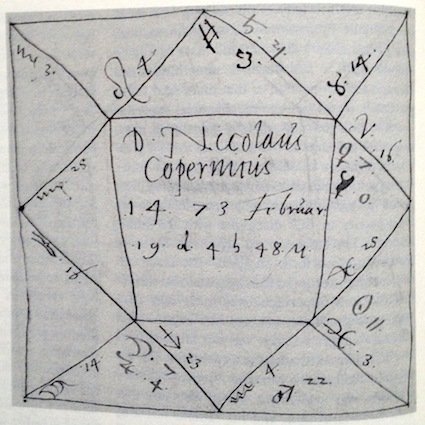 Schöner might also have been the author of a horoscope cast for Copernicus. Judging from the table of contents, Hessler spends some time assessing Schöner’s astrology. Copernicus’s horoscope attributed to Schöner (photo of BSB Cod. lat. Monac. 27003 from R. Westman, The Copernican Question , p. 116). Schöner’s interest in astrology shouldn’t diminish our interest in him, but it should, perhaps, prompt us to wonder about the labels “modern” and “medieval” and the work they do for us (on the force of the medieval label, again see Elly Truit’s posts). After thinking about and studying their maps for the entire semester, students produced some really interesting “Biography of a Map” projects. What started as a short assignment intended to introduce students to the advantages and limits of scientific claims, see “Biography of a Map—Further Experiments in Pedagogy,” quickly grew into a term-long research project. Their initial efforts show considerable promise while also highlighting some challenges. Students were able quickly to see maps as more than neutral reflections of the natural world, see Marketing a Colony—William Penn’s Maps of Pennsylvania. At the same time, students had to confront some unfamiliar challenges, see Mapping Our Way Forward—More Experiments in Pedagogy. Here I want to reflect on how I tried to help students identify, articulate, and confront those challenges. Along the way I will highlight some of their successes. I will also try to indicate where I could adjust the project to make it more successful. 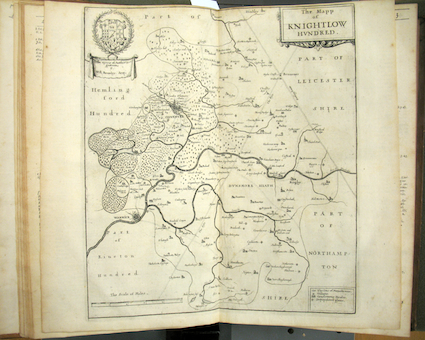 In his account of the history of Warwickshire county, The Antiquities of Warwickshire , Sir William Dugdale included a series of maps, one of which depicts the region of Knightlow Hundred. The purpose of this particular map is to define the geographical setting of a significant area within the historical county of Warwickshire. The book, The Antiquities of Warwickshire , works to preserve the medieval history of this county for the gentry. In fulfilling this purpose, it effectively establishes the status of the landed gentlemen. The county of Warwickshire, as well as the boundaries of hundreds, are divisions that date back to Roman times, so by stressing this area as a defined geographical community of gentry, Dugdale gives them a heightened sense of superiority. The establishment of the boundaries and layout of the community allows him to unite the gentry through an account of a shared past. The audience and commissioners of the book, and thus the map, were the gentry themselves who had a private interest [in] elevating and securing their status. All of these factors interplay to create a map that stresses the relations of the gentry and their history amongst the geographical region of Knightlow Hundred, Warwickshire. For the “Biography of a Map” assignment a number of students selected various maps of Pennsylvania. Happily, at least for my pedagogical experiment, they all strove to understand how these maps functioned for William Penn and Thomas Holme, Penn’s surveyor and cartographer. Students placed the maps into the context of Penn’s religious, political, and economic life. 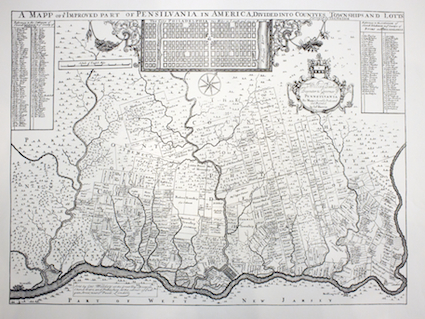 Students examined three early maps of Pennsylvania: A Map of some of the South and Eastbounds of Pennsylvania in America, being Partly Inhabited (1681); A Portraiture of the City of Philadelphia in the Province of Pennsylvania in America (1683); Mapp of the Improved Part of Pennsylvania in America (1687). One component of this assignment asked students to provide a 200-word caption for the map they studied. The goal was to compell students to distill their report down to the most important point. The descriptions below come from those 200-word captions. In 1681, William Penn required a map of his new Province of Pennsylvania. He needed the map to display the lands purchased by his fellow colonists, who those fellow colonists were, and where Philadelphia fit in among their plots. The map also had to be accessible to prospective European colonists curious in buying land in the New World. Thomas Holme, Penn’s Surveyor-General, was commissioned to design it. Over the course of several years, Penn sent out deputy-surveyors to collect data on smaller portions of Pennsylvania. This collage of measurements were compiled to form the Mapp of the Improved Part of Pennsylvania, Divided into Countyes, Townships, and Lotts . The map exhibits fine attention to detail by recording the name of every landowner in 1680s Pennsylvania. 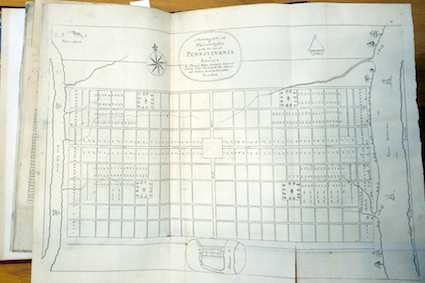 It includes an insert of Holme’s earlier plan of Philadelphia, A Portrait of the City of Philadelphia . The map is also rotated clockwise 45°, presenting the Delaware River as a horizontal boundary to make the rest of the map easier to read. Large empty spaces are included in the upper reach of the map to entice prospective colonists into purchasing plots in Pennsylvania. Penn’s effort to promote and establish his holy experiment. The map depicts the degree of thought that was put into the organization of the colony as shown by straight lined plots, names of credible settlers, organized county lines, available fertile land, and a clearly planned city located off a large river at the heart of it all. Holme’s map provides assurance that Pennsylvania was not the landscape of terrifying wilderness as was reported by early settlers of the new world [sic], but a civilized colony that had the resources provided by wilderness with the security and structure of a civilized society. Students again saw this map as functioning on multiple levels. 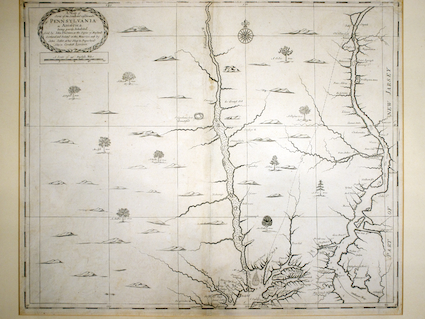 It was, to be sure, a representation of geographic space, But as with his later map of Pennsylvania, here he carefully selected both what to represent on the map and how to represent it. Penn’s selection of information to include on his map reveals how it too served to advance his economic venture, his effort to establish a colony and to sell property. Like his later map of Philadelphia, this one illustrated a letter describing the colony: A Brief Account of the Province of Pennsilvania in America, lately granted under the Great Seal of England to William Penn . This letter outlines the land, its laws, living conditions, and how much the journey costs and how long it takes. Clearly this map was intended to sell people on Penn’s new colony. 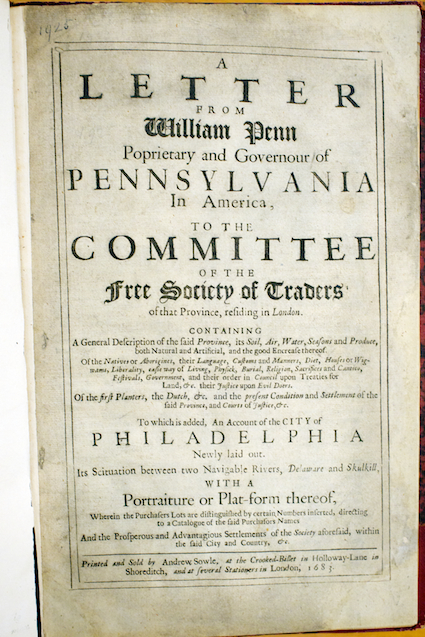 In 1681, William Penn received the Pennsylvania charter. To make money, he needed land buyers so [he] began an extensive campaign to advertise Pennsylvania and its unsettled lands. His project included commissioning cartographers John Thornton and John Seller to construct a large map of Pennsylvania to sell in shops throughout Britian. The map’s title mentions Pennsylvania is “partly inhabited” so potential settlers know there is plenty of unsettled land available for future development, and they know people have been able to live there so residing in Pennsylvania is a realistic possibility. Homesteads and properties have large, legible labels with their owners’ names, which imply to viewers that individual are important to society because so many names are visible on a big map. The map also depicts the wilderness as harmless, filled with rolling hills and common trees so potential settlers feel comfortable with the idea of dwelling in Pennsylvania. 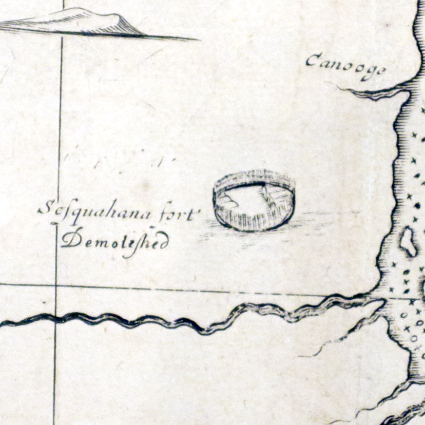 The map does not present Indians, which many Europeans feared, as a threat; instead, it shows the Indian “Sasquahana Fort demolished” and an “Old Indian Field.” Both examples suggest the decline of Indian presence. Thornton and Seller presented Penn with a useful propaganda map to subtly encourage people to purchase Pennsylvania land. Like his previous map, Penn’s map of Philadelphia illustrated a marketing letter. This letter was addressed to the Free Society of Traders and outlined the physical geography and environment of the province, the natives and their customs, and discussed land usage. The unfolding of a new, primarily Quaker settlement, is revealed in a 1683 map of the developing Philadelphia, Pennsylvania. It reveals a developmental method for provinces and cities. After receiving the land as repayment for debt by King Charles II, William Penn set to work strategically placing the city of the province between two navigable rivers and gaining purchases of the plots of land. The map was made by Thomas Holme, the surveyor-general of the territory to be accompanied with a long and descriptive letter by Pen to The Committee of the Free Society of Traders about the ecology and native peoples of the province. Holme’s position as surveyor-general both lends credibility to the document and detracts it because he knew the land very well but was also personally invested in its success. It is a small map; black and white because it is a print and shows a grid-like plan for the city, with eight streets generally running east to west and twenty streets generally running north to south. The map’s purpose beyond relaying information is its important role as a confirmation and validation for those who had purchased plots, aiding the communication between two business parties. A number of plots along both rivers as well as along High Street had been sold. 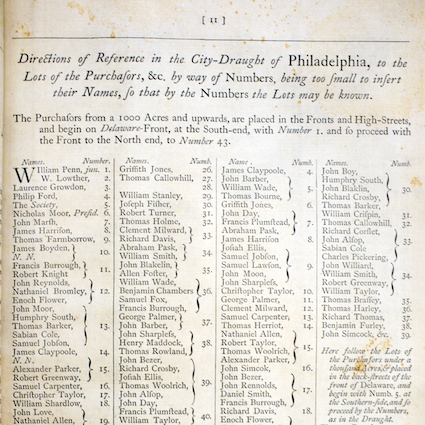 Lists in the letter name the purchasers of these plots and how much additional land outside Philadelphia they had purchased. Plots in the city were allocated according to how much total land the person purchased. I am quite happy with how students approached these maps and tried to make sense of them. 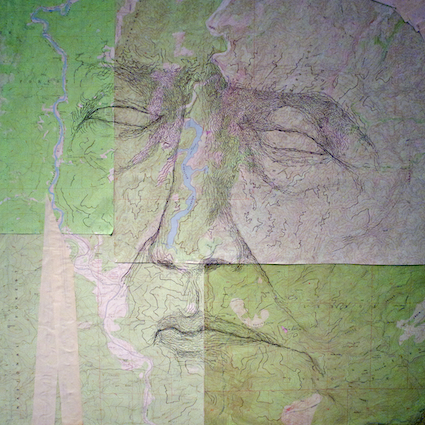 They seem to see maps as pregnant with meaning and signification. What is represented on a map is not accidental but serves the purposes and goals of the map maker and the person who commissioned the map. They seem to be applying a version of E.H. Carr’s advice to study the historian before studying the facts, they are listening for the bees the mapmaker has in his bonnet, to use Carr’s more colorful formulation. I am eager to see if I can get students to move on to further layers of analysis, worrying about the physical details, e.g., the size of the map, that it was part of a letter rather than just a large sheet of paper, how much it cost, etc. Perhaps other students, working on other maps moved in those directions. In a subsequent post I will look at some of the other work to see how well students achieved the goals I set for the assignment.